Majority decision is not always the right decision, and the minority cannot be compelled to abide by it. The most popular decisions come from the majority but the best decisions always come from the conscience. The best leader is one with a conscience not necessarily popular. 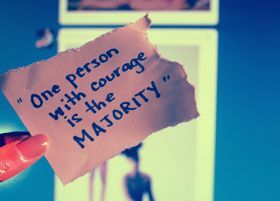 The only thing that doesn't abide by majority rule is a person's conscience. Power must be in the hands of the wealth of the nation, those who have sympathy for property owners and their rights, and who understand that the fundamental task of the government is to protect the minority opulent from the majority. None have I corrupted, none have I defrauded; merchandise have I not made. It is not worth an intelligent mans time to be in the majority. By definition, there are already enough people to do that. The term majority is used to indicate the subset of a set or subgroup of a group, containing more than half the members of a group. It is also considered to be synonymous with plurality, which means a subset larger than any other subset, but it may contain less than half members of a group. When it comes to parliamentary terms, overall majority is the difference of majority between the government and its opposition. Majority always has a say in deciding affairs and settling issues in the parliament.